The D23 Expo is in full swing. And yesterday's animation panel contained many exciting surprises, one of which was the official announcement and release date of The Incredibles 2. Brad Bird is back on board to direct the sequel and has said that the story will focus on Elastigirl. Bird joined Pixar's John Lasseter for the animation panel to share the incredible news as well as some early footage. Many fans noticed that the footage showed off a bunch of new superheroes, quite possibly 25 in total. Fandango managing editor Erik Davis tweeted that "They just showed a lineup if like 25 new superheroes for The Incredibles 2." The footage and animation tests showed off the various characters. That some of the footage used was from tests should indicate that we take this news with a healthy grain of salt because it's called "test" footage for a reason. It is not clear at this time how many of these new superheroes will be introduced for the upcoming sequel, but it's safe to say that it will be a decent amount (probably not all 25) as indicated by the footage shown at the animation panel yesterday. Another piece of information that is not clear is whether or not these new heroes are rivals of The Incredibles. The first movie featured a former fanatical superhero fan, Buddy Pines as a villain so it could be pretty interesting to see a team of villains while getting their backstories as well. The Incredibles 2 is already exciting enough, but the thought of even more characters could usher in spin-offs and possibly even a third movie with a lot more story to tell. This is all speculation at this point, but there has to be reasoning behind showing off so many new characters. John Lasseter also announced that the sequel will take place directly following the events of the first movie, which is also very exciting. The footage shown at the animation panel also showed that the family has moved after the first movie, into a much nicer and fancy house that is built on the side of a lush forest. It was also noted that the family would be unaware of Jack Jack's super powers, so they'll be his little secret again, much like the first movie. 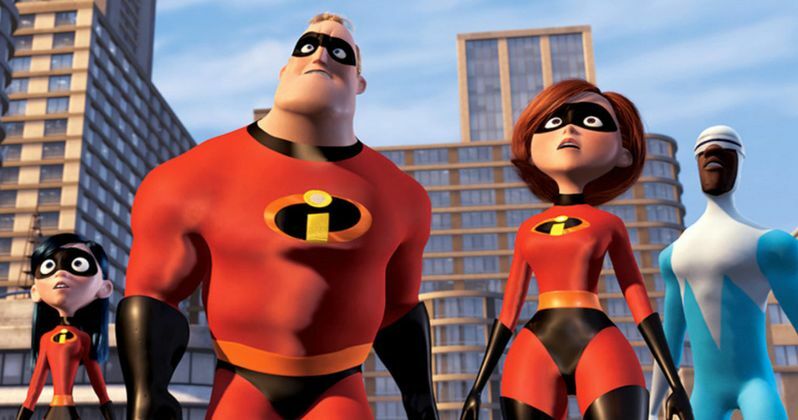 The Incredibles 2 stars Holly Hunter as Elastigirl, Craig T. Nelson as Mr. Incredible, Sarah Vowell as Violet Parr, Huck Milner as Dashiell Robert Parr, Samuel L. Jackson as Frozone, John Ratzenberger as the Underminer, and Brad Bird as Edna Mode. Spencer Fox voiced Dash in the first movie, but his voice has changed too much over the last 14 years for him to convincingly pull off a 10-year old's voice. The Incredibles 2 follows the adventures of the Parrs, a family of Supers and is set to open on June 15th, 2018. The release date isn't too far out, which is a relief to fans, but its still far enough way to get people impatient. Regardless, more news will definitely start trickling out as the release nears.